1.Preheat oven to 475°; position 2 oven racks to center and next lower positions. Place large rimmed baking pan on center rack; preheat 10 minutes. 2.In small bowl, whisk garlic, oil and seasoning. In large bowl, toss carrots, bell peppers, onion, jalapeño and 2/3 oil mixture until well combined. Spread vegetable mixture in single layer on hot tray; roast 8 minutes. 3.In same large bowl, toss steak and remaining 1/3 oil mixture. Push vegetable mixture to 1 side of pan; place steak in single layer on opposite side of pan and return to center oven rack. Wrap tortillas in aluminum foil; place on lower oven rack. 4.Roast steak, vegetables and tortillas 5 minutes. Remove from oven; drizzle steak and vegetables with lime juice. 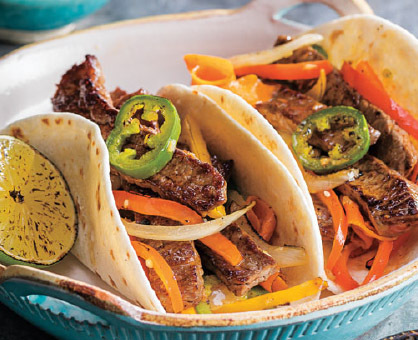 Serve in tortillas with toppings, if desired. For additional flavor, refrigerate vegetables and steak after tossing in oil mixture up to 4 hours before cooking.